We already reviewed the first set of Valiant Comics Minimates (in what was, thanks to the vagaries of our numbering system, actually the 250th Mini-Review), and now the "battle-damaged" versions have arrived. And since they're shipping through Diamond, you can just pick them up at your local comicshop, rather than having to order them from TRU's website. Aric of Dacia, a fifth century Visigoth armed with the universe's most powerful weapon, is all that stands between the Earth and all-out annihilation at the hands of the alien race that abducted him from his own time. The Vine destroyed Aric's world. Now he will give them war. It turns out the X-O Armor is a living combination of metal and plant, and has the name "Shanhara" because that's the alien girl whose father developed it, who first wore it, and whose mind lives on as part of its consciousness. This figure represents the armor as it wraps around Aric, so compared to the full suit, he's missing some of the blue panels, and there are spots where we can see his skin. The yellow "petals" are painted to look like they're 3D, curling down into place to protect their wearer. Rather than having a painted-on helmet, this time it's a removable piece. It's fully sculpted, and has a completely clear faceplate. This is awesome! The shade of blue on this figure is just a bit lighter than the previous figure, so the helmet doesn't quite match if you swap it over to that one, but it's not so different that it will look out of place. 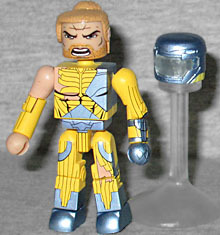 The set also includes a second head, which has the same angry expression as the one he's wearing in the package, but is set apart by painted stubble. It's an unusual choice - why make a second head just for the beginnings of a beard? - but we're not going to complain. That one also gets Trevor Slattery's bun hair. Since he'd been a prisoner for a while, and had a full beard, I'm surprised they didn't include the other hair piece as well. When Aric first found the armor, it was curled up in a ball and floating in mid-air. 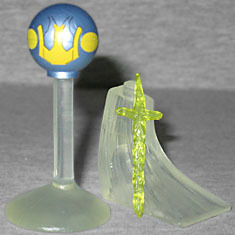 To re-create that, the set comes with a ball painted yellow and metallic blue, and a "hover" stand to let it float. Is it a new piece? No, it's Mysterio's head! That's brilliant! Absolutely terrific re-use. Oh, and when the armor first wrapped around Aric, the helmet floated separately until he put it on, so we also get a clear head that can fit on the hover stand, allowing the helmet to sit properly. And if all that weren't enough, he's got his yellow energy sword, and a single-foot "swoosh" stand. 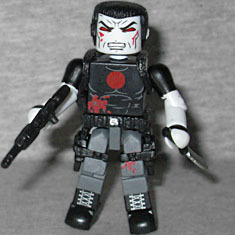 Brought back from the dead and infused with cutting-edge nanotechnology, the walking weapon of mass destruction now known as Bloodshot has escaped his handlers at Project Rising Spirit and vowed to bring war down upon his masters... but first he'll have to figure out where the programming ends and the real "him" begins. I do wish there was new bio text on the back of the box, because I'm only vaguely familiar with what the "Harada Protocol" in this figure's name means. 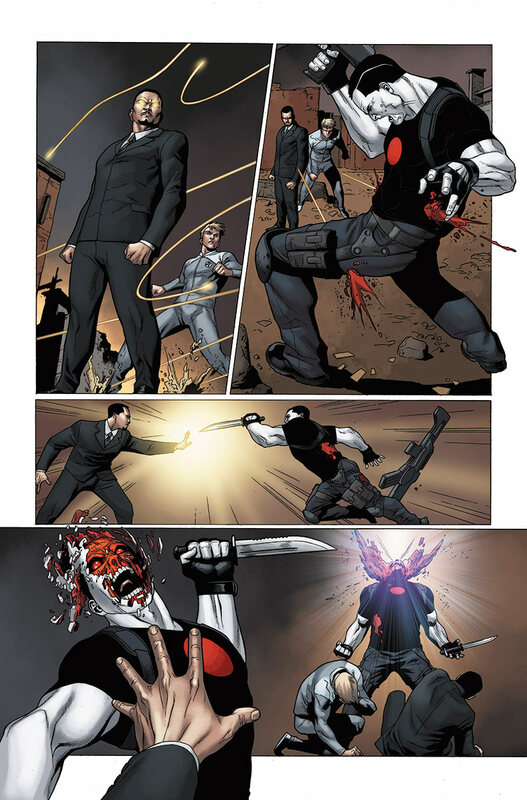 A program buried deep within Bloodshot's nanites activated when he met Toyo Harada (the world's most powerful psychic and a major competitor against Project Rising Spirit), which sort of sent him into berserker mode. Harada fought back, and thus we get the battle damage. Bloodshot is wearing the same outfit as before: black boots and gloves, grey pants, and a black T-shirt with a big red dot on the chest. He has bullet wounds on his leg and abdomen (from when Harada turned his bullets back at him), and some blood on his face. Of course, if you give him his alternate head, he has a lot of blood on his face: Harada's first defense was to flay all the skin off Bloodshot's face. Yowch! That's why the second head looks like Red Skull. The figure is armed with an M-16, a knife, and two pistols. Only the pistols are shared with the previous figure, which draws attention to one of the best things about this set: if you have the normal figures and this Battle-Damaged pair, they each come with certain accessories the other doesn't, making for a lot of mix-and-match value. The packaging claims there's a "FREE comic included in every box! ", but unless it's invisible, there was nothing in here. Last time it was printed in the customer feedback insert, but there wasn't one in this set. But we do still get the code ("BATTLEMATES") for free digital downloads of X-O Manowar and Bloodshot #1. The modern ones, not the ones from the '90s - because despite Rustin's poor reading comprehension, these are the rebooted versions of the characters, the ones that are relevant now. And this is a top-notch Minimate set of them! This entry was posted in Art Asylum, MMMR and tagged Minimates, Valiant. Bookmark the permalink.